Anyone who visits Arlington National Cemetery (more than 4 million people do so every year) knows that America’s most hallowed ground, the final resting place of more than 400,000 service members, veterans and their spouses on 624 acres, is also a sanctuary for lovers of flowers and trees. The cemetery is a living memorial to veterans. 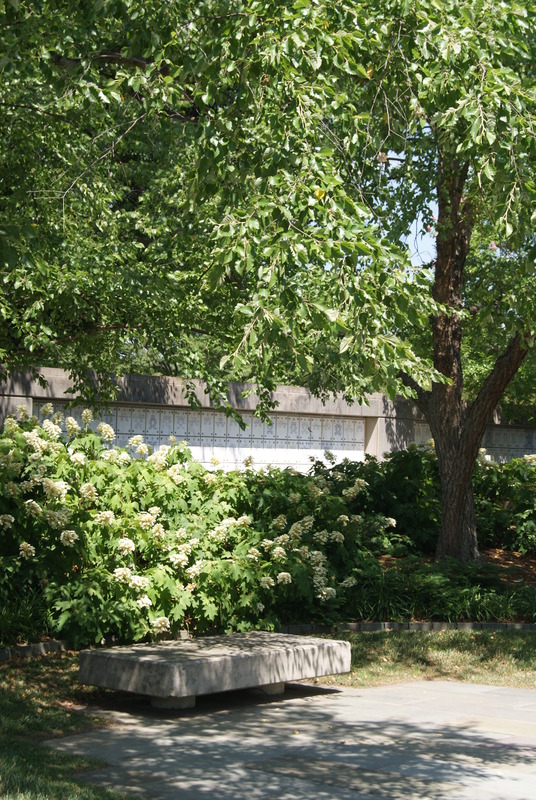 ArbNet Arboretum Accreditation Program and Morton Arboretum in Lisle, Illinois last year awarded Arlington National Cemetery Memorial Arboretum Level II accreditation on a scale with IV the highest. 1. The cemetery leaves little to chance. The horticulture department has only three employees, so contractors do the hands-on work of keeping grass, trees and gardens manicured. For example, the largest contract, for the turf and grounds management of 576 acres, specifies weekly mowing and trimming. Grass must be 3 ½ inches to 5 inches high.Every tree, in theory, gets pruned every four years. About 200 trees are removed every year, and 240 replacements planted. The gardening contract specifies hand weeding with no pesticides, except for the roses, said Stephen J. Van Hoven, arborist, urban forester and chief of the cemetery’s horticulture division. 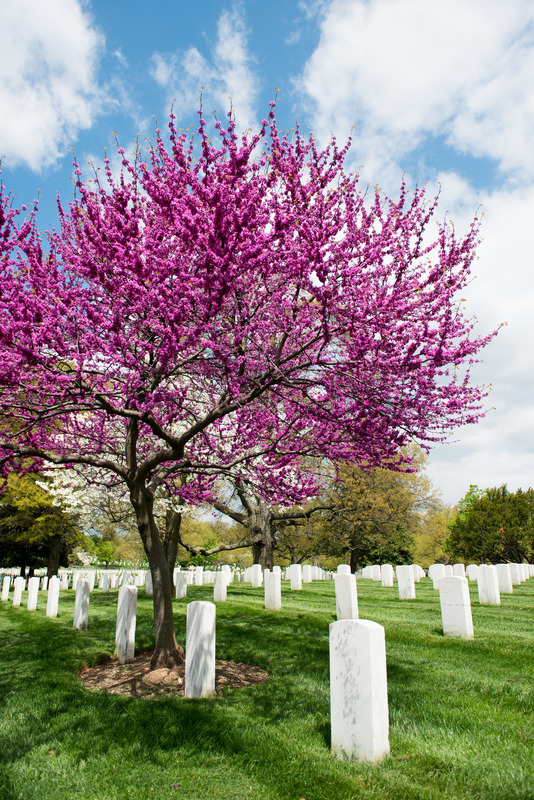 Among the cemetery’s more than 8,600 trees (325 varieties and species) are three Virginia state champions and one state co-champion. Champions are the largest trees of their species — by tree height, crown spread and trunk circumference — as designated by the Virginia Big Tree Program at Virginia Tech. 3. Non-native invasive trees and plants still have a place. Two of the state champions, royal paulownia (Paulownia tomentosa) and sawtooth oak (Quercus acutissima), are nonnative. The royal paulownia is “the biggest weed in the state of Virginia,” according to Van Hoven. Also nonnative is the beautiful wisteria on the pergola that shades the colonnade at the Old Amphitheater, built in 1873 and now called Tanner Amphitheater. Historic photos show wisteria, so the Chinese and Japanese vines stay. 4. Woodman, save that tree! The cemetery, in danger of running out of space for burials, in 2013 cut down hundreds of old trees in the Arlington Woods area to expand burial space. The plan angered tree advocates, but cemetery officials countered that the trees weren’t that old; the area had been cleared during the Civil War. The U.S. Army, which runs the cemetery, is in talks with Arlington County and the state over a land swap that would add 38 acres of burial space, extending the life of the cemetery 20 years. Without the new acreage, the cemetery could close to new burials in the 2030’s. 5. You can walk it. The cemetery is open 365 days a year. No dogs, please. Park in the paid garage or trust Metro, which has a stop nearby. With up to 30 funerals every weekday and up to eight funerals on Saturdays, you may see the horse-drawn caisson carrying a flag-draped coffin and hear the tribute of rifle volleys. 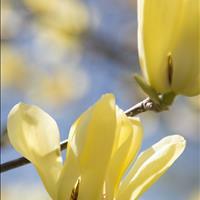 The Horticultural Division offers guided walking tours, focusing on trees, flowers, pollinators and other garden topics. Check out the Explore section of Arlington National Cemetery for tour dates. Carry water, wear sunscreen, and be prepared to walk at least two hours. This entry was posted in Five Things You Didn't Know About..., Public Education, Regional Gardens and tagged Arlington, Arlington National Cemetery, Native plants, Northern Virginia. Bookmark the permalink.